Traditional astrologers believe that Cancers are most compatible with Taurus, Cancer, Virgo, Scorpio, and Pisces, and least compatible Aries, Gemini, Libra, Sagittarius, and Aquarius, but what do the actual marriage and divorce statistics say? It’s no surprise that two Cancers are inclined to stay together. These signs share a love of cozy domesticity and often outdoor activities as well. They usually prefer natural surroundings and nature-based activities to noisy, chaotic big-city venues, and they tend to be reliable, sensitive to one another’s feelings, and able to take care of each other in times of crisis. It’s also unsurprising that Cancer men are least likely to marry Aries women. Aries bluntness and insensitivity can be upsetting for Cancers, and because these are both cardinal signs, there is a tendency to clash. Cancer may view Aries as selfish, while Aries believes that Cancer overreacts. The higher-than-average rate of marriage with Cancer women is unsurprising because two Cancers are likely to share lifestyle preferences, ways of relating, attitudes, and values. Finding Libra at the bottom of the list is also in line with traditional astrological beliefs. 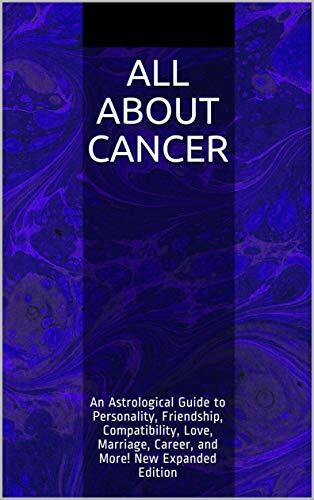 Cancers tend to prefer a direct approach to addressing emotional issues or differences of opinion, so they are able to bring up difficult subjects and start stressful conversations, whereas Libras tend to evade anything unpleasant if they can find a way to do so. Cancers like to clear the air and want to talk everything out completely (even things that would be better forgotten), whereas Libras avoid dealing with emotionally charged issues even when there is a strong need to do so. This can lead to a communication breakdown as Cancer desperately tries to draw Libra out and Libra evades because she doesn’t want to have a stressful conversation. However, if the two individuals have very compatible rising signs or moon signs, opposing tendencies will be be minimized and compatibility enhanced. Sachs found no statistically significant results for the signs Cancer women are most or least likely to marry, but they have a higher-than-average divorce rate with Aquarius men and are least likely to divorce Tauruses and Cancers. The above-average divorce statistic for Cancer women and Aquarius men accords with traditional astrological wisdom. Aquarius seeks change and novelty, whereas Cancers like to have an established and secure home base. Also, Aquarians tend to be emotionally detached, whereas Cancers have intense moods and feelings. A Cancer may not get the reassurance, compassion, and personal attention she needs from an Aquarius because Aquarians tend to be independent and sociable, preferring to spend their leisure time with groups of friends rather than one person. With the Cancer-Aquarius pairing, Cancer may feel insecure while Aquarius feels irritated or oppressed by Cancer’s need for reassurance. Cancer women’s tendency to stay with Taurus men is also in line with traditional astrological beliefs. A typical Taurus can offer security, loyalty, reliability, and a solid domestic environment, so these two signs have the potential to build a good life together. Why do Cancer women marry Taurus men more often than Cancer men pair up with Taurus women? Perhaps the strength and stability Taurus provides are more important to Cancer women than they are to Cancer men. Although there weren’t any huge differences in marriage rates from one sign to the next, Scorpio, a sign considered to be very compatible with Cancer, tops the list, whereas Cancer’s opposite sign, Capricorn, is at the bottom. The top two most frequent marriage pairings are matches that are considered to be very compatible: Cancer-Cancer and Cancer-Taurus. Typical Cancers and Tauruses share a love of the natural world and tend to avoid huge parties or noisy clubs, preferring to entertain at home, visit friends in their homes, or get out into nature (gentle walks or rugged hikes and other more intense activities, depending on the individuals). They share a love of good food and domestic comforts, and both like to create a stable, cozy home base. Finding Pisces at the bottom of the Cancer women’s marriage list is surprising, as astrologers consider these two signs to be very compatible. However, Cancer women often seek assertive, decisive partners and Pisceans tend to be neither assertive nor decisive (there are exceptions to this rule: Pisceans who have their ascendants in fixed signs such as Taurus or Scorpio; fire sign such as Aries, Leo, or Sagittarius; or the cardinal earth sign of Capricorn tend to be more dominant and forceful). The best match for Cancers of either gender is apparently another Cancer, and for Cancer women, Taurus as well. Aquarius, Libra, and for Cancer women only, Pisces, appear to be less favoured pairings in some cases. However, Cancers who find themselves romantically entangled with one of the less compatible signs should not despair. Plenty of relationships and marriages between supposedly incompatible signs have lasted. It’s important to keep in mind that these are statistical tendencies; this doesn’t mean that every romance between incompatible signs is doomed. For example, out of 6,498,320 marriages encompassing all possible sun sign combinations in the Castille study, there were 964 more marriages between Cancer men and Cancer women than would be expected if sun signs had no effect, whereas between Cancer men and Libra women, there were 465 fewer marriages than would be expected if pairings were random. However, there still were many marriages between the supposedly least compatible signs. * The methodology of the Sachs study has been criticized and remains controversial. I have found no critiques of the Castille study thus far. I am a cancer man and have been happily married to a libra woman for 41 years. How do you explain this? I was with a Libra woman for several years…. She had too much unfinished business with ex lovers and husband’s. Because it means that you are meant for each other and no other forces can overcome the God’s will and hand in your life. All the best. May God bless the your family. Because the sun sign alone does not completely determine compatibility, look at both your venus and mars signs as well. Cnacer women and scorpio can have beautiful married life ….? They will be true to each other ? Any chances to get married ? Mine did not work after 9 years. They are indecisive, always running after another woman. I am cancer women and I fell love with pisces man can you please suggest me?? He is perfect for me or not??? I am a cancer man in love with a Capricorn woman. We are getting married on Jan 11 or 18. Will it last. I can only wish you luck… Capricorns have great qualities but something of an obsession with material wealth, can rapidly turn against you if they think you are lacking ambition. They can also be cruel to the myriad of emotions that Cancer tends to feels, emotions and feeling is not something they care much about. Cancer man here… I managed to fall in love with a Sagittarius earlier this year and we’ve been dating a while with no arguments so i fell we are perfect for each other. I’m a Cancer Man and I’ve fallen in love with an Aries woman. How do you think it will turn out? With lots of love and passion. Some of those relationships last and have children, some don’t. I’ve seen both cases.